The 99th AAI Annual Meeting! The Scientific Program at IMMUNOLOGY 2012™ featured cutting-edge developments from scientists at every career stage, including world leaders in immunology presenting their research in plenary lectures and special symposia, award lecture presentations, and major symposia. In addition, more than 550 other AAI members and guests presented their latest findings in over 100 sessions. And over 1,600 poster presenters displayed and discussed their findings throughout the week. Signaling through the Tec family kinases; how do these molecules work? Richard M. Locksley, HHMI, University of California, San Francisco, Innate helper type-2 cells: the missing piece in allergic immunity? Jay K. Kolls, University of Pittsburgh School of Medicine, Why do we have Th17 cells in the lung? AAI President Leslie J. Berg will introduce the awardee and present the award immediately prior to Dr. Atkinson's lecture. Generously sponsored by BD Biosciences, Inc.
AAI President Leslie J. Berg and BD Biosciences Vice President of Biological Sciences Robert Balderas will introduce the awardee and present the award immediately prior to Dr. Crotty's lecture. AAI President Leslie J. Berg and a representative of Life Technologies Corporation will introduce the awardee and present the award immediately prior to Dr. Cresswell's lecture. John R. Schreiber, M.D., M.P.H. The AAI Excellence in Mentoring Award recognizes exemplary career contributions to a future generation of scientists. The award will be presented prior to the start of the AAI President's Symposium. One of the most effective approaches to combat infectious diseases worldwide is through population-based interventions such as vaccines, which immunize and protect individuals against a variety of pathogens that cause significant morbidity and mortality. This session will focus on advances by immunologists in identifying novel solutions to the challenges of developing vaccines and monitoring their efficacy in humans. Recent changes to the NIH peer review system, including the elimination of the A2 grant application, have pleased, puzzled, and angered both applicants and reviewers. With federal budgets constrained and stakes as high as they have ever been, understanding the NIH peer review process is essential to securing funding. This session will explain the system, including the role and power of both CSR and the individual institutes, and provide attendees with the opportunity to ask questions, express concerns, and share experiences. The federal Small Business Innovative Research (SBIR) and Small Business Technology Transfer (STTR) grant programs award approximately $2.5 billion annually for small businesses to perform innovative research. Researchers at academic institutions can benefit from collaborations with these small business firms. This session will describe SBIR/STTR funding opportunities, highlight their potential benefits to academic researchers, and explore techniques for maximizing the success of grant proposals. Jay K. Kolls, Professor, University of Pittsburgh School of Medicine, Commercializing your research: are you ready for an SBIR/STTR grant? Many opportunities exist in industry for a scientist with advanced degrees. There are positions in laboratory research, program management, business development, regulatory affairs and clinical trials oversight, and medical liaison. This panel features scientists employed in a variety of positions in industry to share their career paths and highlight the skills required to succeed in these careers. Following the panel discussion, enjoy casual conversation with the speakers and other industry connections at a networking reception. Refreshments will be provided. Andy Kokaji, Senior Scientist, STEMCELL Technologies, Inc.
Chris Schwab, Senior Medical Science Liaison, Human Genome Sciences, Inc.
Olivia Schneider, Chief Scientific Officer, Shenandoah Biotechnology, Inc. This workshop will feature programs and topics which strengthen science education in both high schools and undergraduate institutions. The session will include 2011-2012 participants of the AAI High School Teachers (HST) Summer Research Program, which pairs high school science teachers with established AAI member immunologists who mentor them in their laboratories in a "hands-on" summer internship. In addition, this session features a former AAI HST Program participant who received a Presidential Award for Excellence in Math and Science Teaching in 2008; the coordinator of the summer research program for teachers at National Jewish Health to address educational outreach; the director of the innovative Citizen Science Program at Bard College with the goal of improving science literacy in college freshmen; and the 2003 AAI Excellence in Mentoring Award recipient to address excellence in undergraduate science and research programs. This always popular session opens this year with former AAI President Olivera J. (Olja) Finn, Distinguished Professor and Chair, Department of Immunology and Distinguished Professor, Department of Surgery, University of Pittsburgh School of Medicine, and Co-Leader, University of Pittsburgh Cancer Institute Immunology Program. Dr. Finn actively addresses career development issues internationally through organizations in the United States and her participation in the International Union of Immunological Societies (IUIS) Gender Equality and Career Development Committee. At this session, she will offer guidance for achieving distinction in one's field while balancing the demands of research, service to one's profession, and commitment to family. Roundtable discussions follow, led by experienced scientists on specific career issues and options. Attendance is limited. Registrations will be accepted on a first-come, first-served basis. Table Leader: Monica Mann, EMD Serono, Inc.
Table Leaders: Mary E. Keir, Genentech, Inc.; Daniel J. Cua, Merck Research Laboratories; Robert Balderas, BD Biosciences, Inc.
Table Leader: Alexander Swirnoff, Pfizer, Inc.
AAI wishes to welcome new Regular and Trainee members joining AAI for the first time. AAI President Leslie Berg and other AAI leaders look forward to meeting you personally. Please join us with your invitation in hand for light refreshments and casual conversation. Event by invitation only. How can a reviewer help improve the process of scientific publication? What do journal editors look for from reviewers of manuscripts? When writing a manuscript, what steps can an author take to enhance its impact on editors, reviewers and, if accepted for publication, on readers? How can authors enhance the presentation of data in figures? What are recommended practices for responding to reviewers' comments? In addition, hear from the Editor-in-Chief of The Journal of Immunology on how to avoid possible ethical missteps in scientific publishing. Zoonotic diseases – those that are naturally transmitted between vertebrate animals and humans – represent one of the leading causes of illness and death from infectious disease worldwide. This symposium will address contemporary issues in immunology, vaccination, and pathogenesis of zoonotic infections, ranging from avian influenza to new emerging and bioterrorism threats including Q fever, hantavirus, and Francisella. Susan L. Swain, University of Massachusetts Medical School, Can we overcome the defects of aged CD4+ naive T cells? Anne Davidson, Feinstein Institute for Medical Research, Renal macrophages in lupus nephritis – friend or foe? Charles R. M. Bangham, Imperial College London, How does the human leukemia virus (HTLV-1) persist in vivo? Tracy Hussell, Imperial College London, Immune pathology in lung viral infection: innate or adaptive? Through workshops, roundtables, and one-on-one counseling, IMMUNOLOGY 2012™ provides critical career development programs. Table Leaders: Mary E. Keir, Genentech, Inc.; Daniel J. Cua, Merck Research Laboratories; Representative of BD Biosciences, Inc.
Small breakout sessions for individual consulting will follow from 1:45 PM to 3:45 PM. Bring your CV! This session will include the annual report to AAI members on AAI and The Journal of Immunology business affairs and will feature select 2012 AAI awards presentations and acknowledgements. Lunch will be provided. Block Symposia - Selected abstracts are programmed into oral sessions called Block Symposia. Each Block Symposium is made up of approximately 8 selected abstracts. There are 69 Block Symposia programmed for this annual meeting. Posters - The most interactive part of the meeting! Discuss data and research issues firsthand with authors at the Poster Sessions. Posters will be displayed Saturday through Monday in the Hynes Convention Center Auditorium and Exhibit Hall C-D from 9:30 AM – 4:30 PM. Dedicated Daily Poster Presentation Hour from 2:30 PM to 3:30 PM! No concurrent symposia, presentations, or other sessions will be held during the poster presentations at this time. Accepted posters may be displayed for the duration of the meeting! Authors are encouraged to leave their posters up throughout IMMUNOLOGY 2012™. Generously sponsored by eBioscience, Inc.
Come directly from the President's Address into the majestic glass logia of the Hynes Convention Center to seek out old friends and make new acquaintances at the Opening Night Welcome Reception. The reception is generously supported by eBioscience to welcome you and wish you a pleasurable, productive week. At this important event, AAI leadership honors the association's dedicated member volunteers – the committee members, editors, mentors, instructors, and others – who work on the membership's behalf throughout the year by giving generously of their time in support of the AAI mission. Open to 2011-2012 AAI volunteers, by invitation only. IMMUNOLOGY 2012™ Gala "Casino Night in Back Bay"
Everyone's a winner at Casino Night in the Back Bay! There, you and your most circumspect colleagues can throw caution to the winds and revel in one another's encounters with Lady Luck. 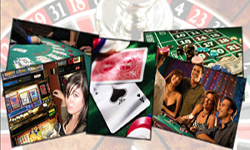 It's your risk-free opportunity to "go for broke" and hone your gambling skills, moving from table to table for Black Jack, Roulette, Texas Hold 'Em, Craps, Slots, and more. When your chips are gone, continue the fun at the photo booths or on the karaoke stage performing your favorite song! AAI wishes to welcome new Regular and Trainee members joining AAI for the first time. AAI President Leslie Berg and other AAI leaders look forward to meeting you personally. Please join us for light refreshments and casual conversation. Event by invitation only. Exhibitor Workshops - Take advantage of the opportunity provided by the Exhibitor Workshops to explore exhibitors' latest technologies, products, and services. 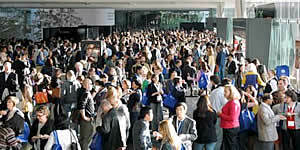 For a list of 2012 exhibitor workshops, see pages 47-48 of the Program. Product Showcases - Be sure to catch the presentations and demonstrations of exhibitors' new products. Sessions are scheduled in 15-minute intervals on the Exhibit Hall Stage. For a list of 2012 product showcase, see page 49 of the Program. Presentations are planned and conducted by exhibitors; the listing of these presentations does not constitute endorsement of any products or services by AAI. ©2011-2012 The American Association of Immunologists, Inc. All Rights Reserved.